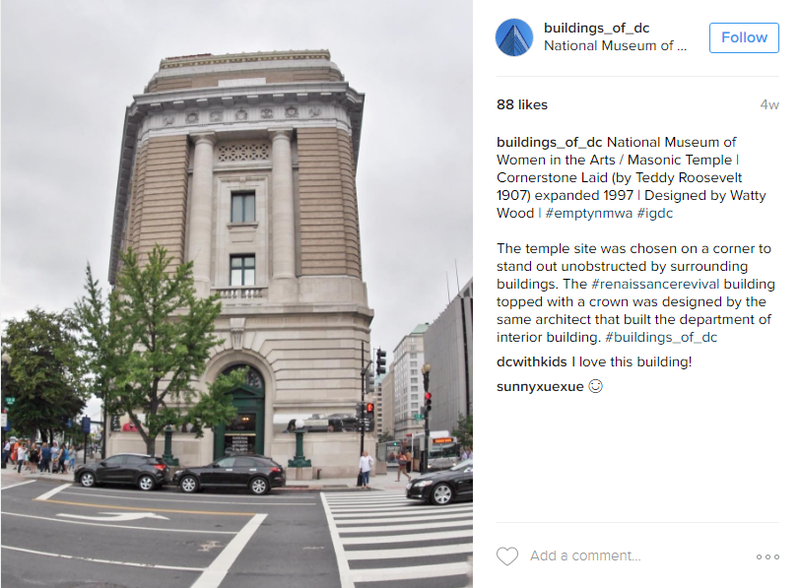 More than 25 D.C.-area Instagrammers visited NMWA on June 17, 2016, for a before-hours Instameet. With access to the empty galleries, local photographers explored the museum’s building and collection, as well as the special exhibitions She Who Tells a Story: Women Photographers from Iran and the Arab World and Alison Saar In Print. Attendees including @2020_productions snapped photographs of the event’s snacks, including cookies inspired by the building’s façade. Participants explored the building’s history through a staff-led tour while sharing their tagged photos on social media with #EmptyNMWA. Gordon Umbarger, NMWA’s director of operations, explained the fascinating history behind the museum’s architecture. During an outdoor segment of the tour, attendees learned that Theodore Roosevelt laid the building’s cornerstone using the same gavel and trowel that George Washington used for the Capitol Building in 1793. @dc_explorer captured and shared this commonly overlooked feature. Did you know that the building was first constructed as a Masonic temple in 1907 and women were not allowed entry? It seems fitting that today the building houses works by women artists! Visitors can detect traces of Masonic architecture around the museum. @korofina zoomed in on the building’s exterior frieze featuring the square and compass symbols. @buildings_of_dc captured the full building, which was designed in a Renaissance Revival style by prominent D.C. architect Waddy Wood, from a vantage point across street. For additional income the Masons rented parts of the building to other local businesses, including George Washington University, a dentist, an insurance agent, and a uniform supply shop. The space hosted the Pix Theatre during the 1940s and early ’50s—until the Masons terminated the theater’s lease due to the sometimes racy nature of its movies. @kjhower1 captured decorative details that used to frame the movie screen. In 1983, NMWA’s founders, Wallace and Wilhelmina Holladay, purchased the space and opened the museum to the public in 1987. Ten years later, the museum opened an addition within an adjoining building. Formerly a “D.C. pleasure palace,” the building was renamed the Elisabeth A. Kasser Wing, and it now houses NMWA’s Museum Shop and sculpture gallery. Participants found more Insta-worthy subjects inside the museum. @cczablotney snagged an incredible photo of the museum’s Great Hall and one of its iconic chandeliers while @kaitlyntward focused on the marble balustrades. @beingdave even observed the benches in the Great Hall designed by Florence Knoll. 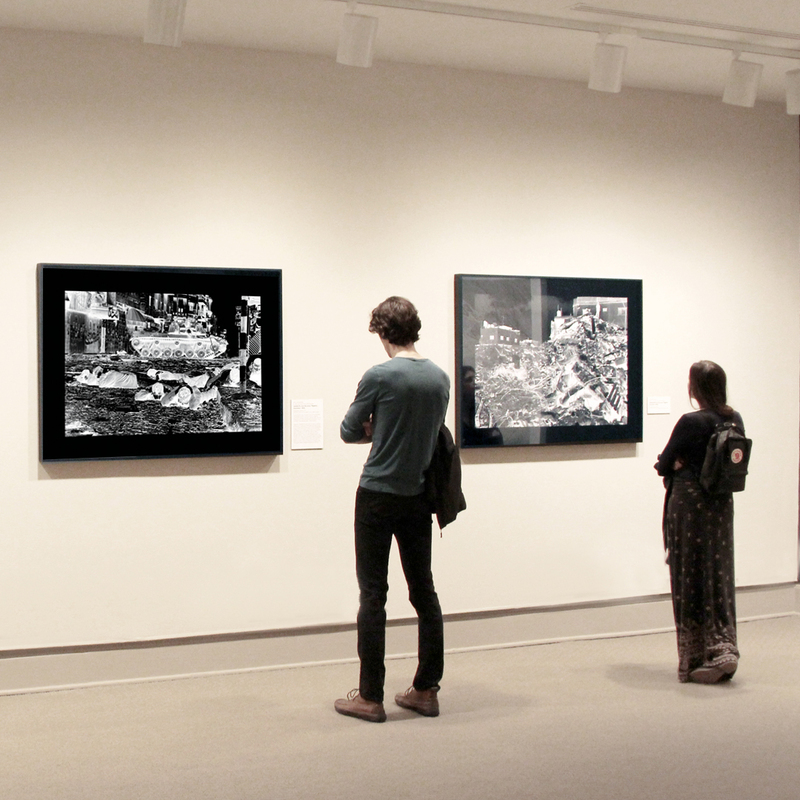 Visitors also ventured into the collection galleries and special exhibitions. 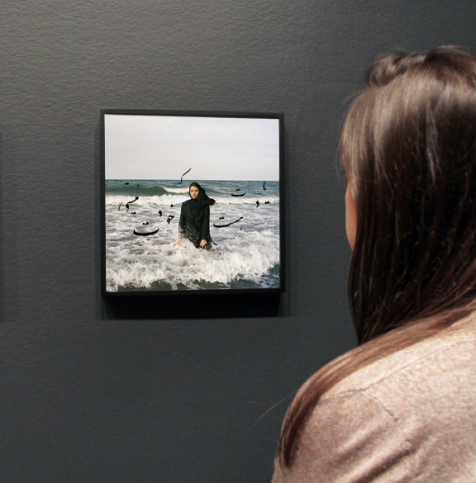 @setarrra photographed another participant mirroring a photograph from Tanya Habjouqa’s “Women of Gaza” series, on view in She Who Tells a Story. It was a fun and creative Instameet! To see all the event’s photos, check out the Storify compilation or browse #EmptyNMWA on Instagram. Follow @WomenInTheArts on Instagram and Twitter to learn about future Instameet opportunities. —Casey Betts is the summer 2016 digital engagement intern at the National Museum of Women in the Arts. The next time you visit NMWA, come to the Betty Boyd Dettre Library and Research Center to see new books on women in the arts, as well as reference books, artists’ books, and more. Meet Tanya Habjouqa at the museum on Wednesday, July 27 for a special in-gallery program. Jordanian photographer Tanya Habjouqa reveals the agonizing and absurd instants of occupied Palestinian life in Occupied Pleasures. In the foreword, poet Nathalie Handal describes the book as “a collection of stories captured in images, images like Palestinian lives lived in instants only.” Habjouqa’s photographs portray joyous moments­­ of daily life—a family picnics together, women dance, and children swim—that are surrounded by dark circumstances. The occupation is obvious in these images: the menacing security wall looms in the background, a man sits at a checkpoint, a woman holding a bouquet wanders through the tunnel between Gaza and Egypt to a forbidden wedding. 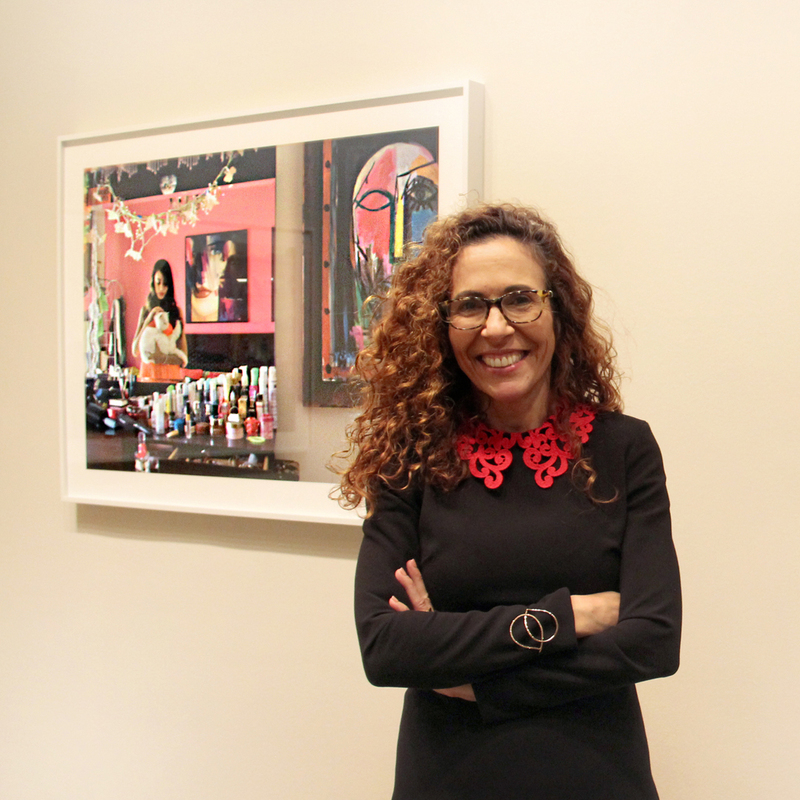 Habjouqa’s work has been exhibited and published worldwide, and six of her photographs are currently on view at NMWA in She Who Tells a Story. She currently works from East Jerusalem on projects concerning identity politics and subcultures of the Levant. Habjouqa is also a founding member of the Rawiya photo collective, a group of women photographers from the Middle East who challenge stereotypes and support fellow women photographers in the region. 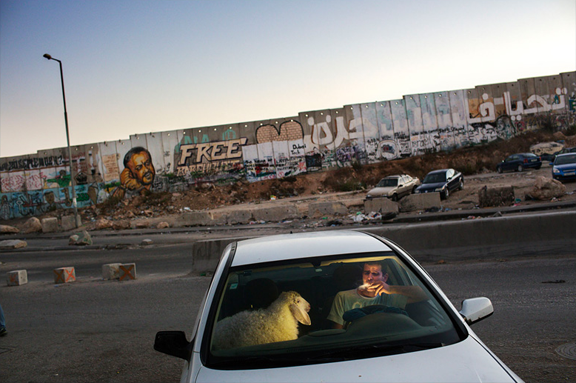 In one captivating photograph, a man smokes a cigarette in his car outside of a checkpoint, with a sheep in the passenger seat of his car. “Detention juxtaposed against a moment of respite illuminates the extremities of the Palestinian narrative: celebration and mourning, respite and struggle, and the pleasure of smoking a cigarette,” writes Khalili. Through this collection of photos, Habjouqa exposes moments of levity to give the viewer a window into the humanity of the Palestinian people. Meet artist Tanya Habjouqa at the museum for an in-gallery conversation on Wednesday, July 27. Reserve your spot on NMWA’s website. All are welcome to look at this catalogue, which is available in the Betty Boyd Dettre Library and Research Center at the National Museum of Women in the Arts. 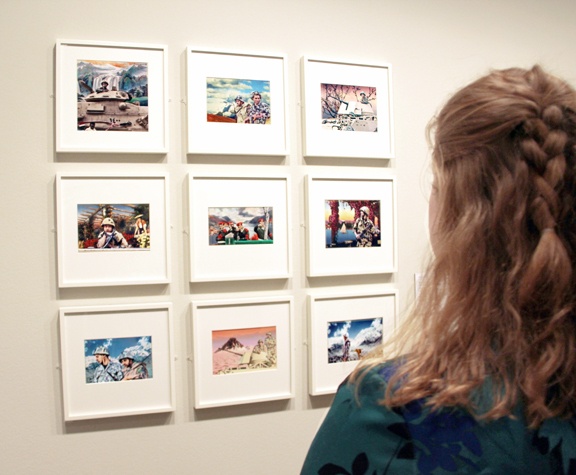 If you’re touring the museum, the library is open to the public Monday–Friday, 10 a.m.–12 p.m. and 1–5 p.m.
—­­Katy Seely was the winter/spring 2016 intern in the Library and Research Center at the National Museum of Women in the Arts. Shirin Neshat moved to the United States during the Iranian Revolution (1979) and studied fine arts. In 1990, Neshat returned to visit Iran and found a changed country. Inspired to create her best-known photographic series Women of Allah (1993–97), Neshat wrote verses by contemporary Iranian women writers across the surface of her photographs in Farsi. 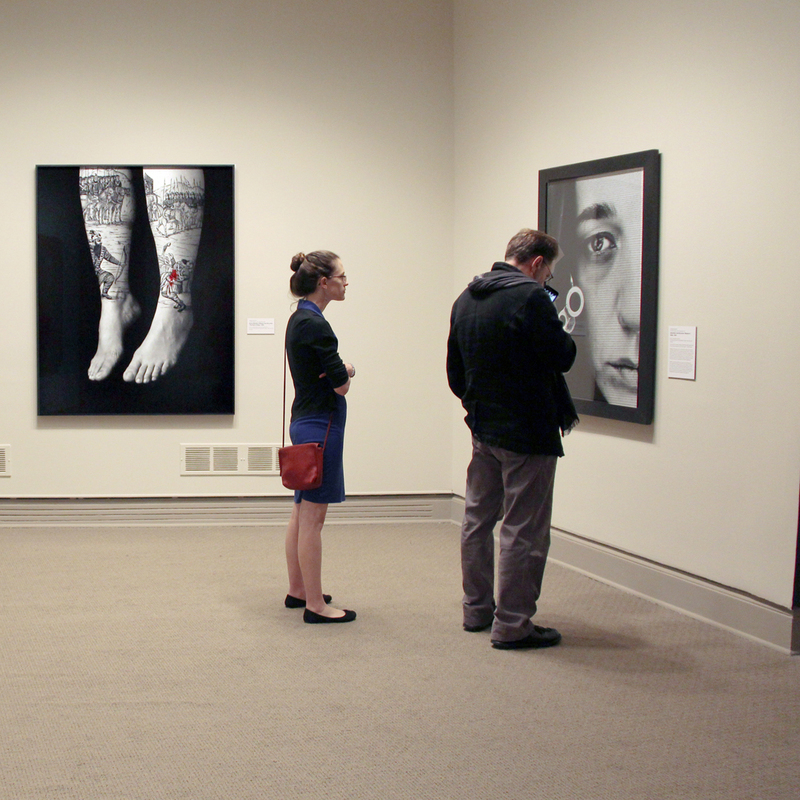 Five photographs, including one from Neshat’s “Women of Allah” series (1993–97), and four from “The Book of Kings” (2012) are included in the exhibition. “The Book of Kings” marks Neshat’s return to black-and-white photography. 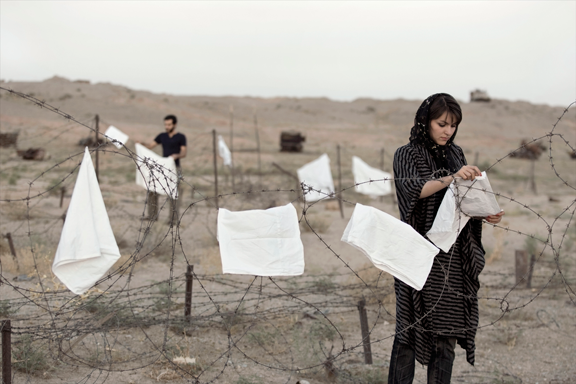 Neshat found inspiration in stories from participants in the Arab Spring in 2011 and protesters from the Iranian Green Movement in 2009. 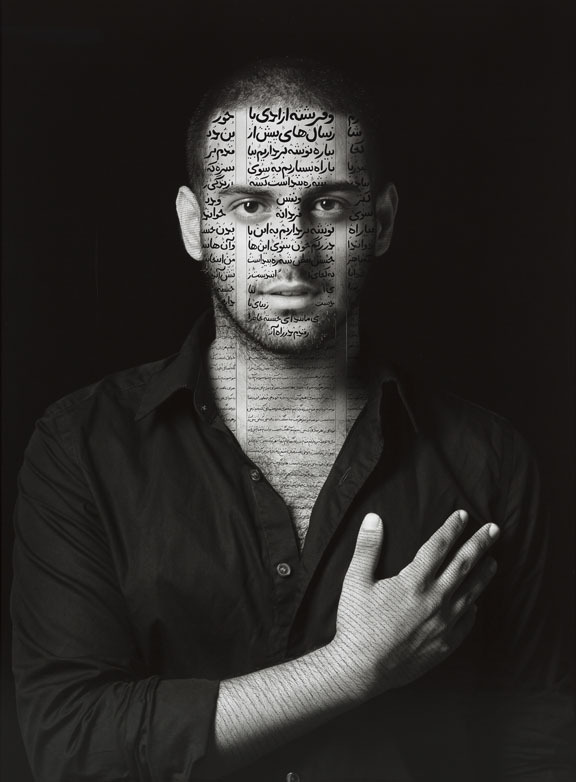 One portrait on view, Ibrahim (2012), belongs to a part of “The Book of Kings” series Neshat calls the Patriots. The figure meets the viewer’s gaze with his right hand placed over his heart. Neshat inscribed the portrait with calligraphic verses in Farsi from contemporary Iranian poetry, giving the work a powerful effect. Photographer Rania Matar says, “I was born and raised in Lebanon. I moved to the U.S. to go to architecture school in 1984. . . . I am very much part of both cultures, and both places have shaped my identity.” Matar’s documentary photographs depict women and girls in the U.S. and the Middle East, highlighting universal themes of developing identity. 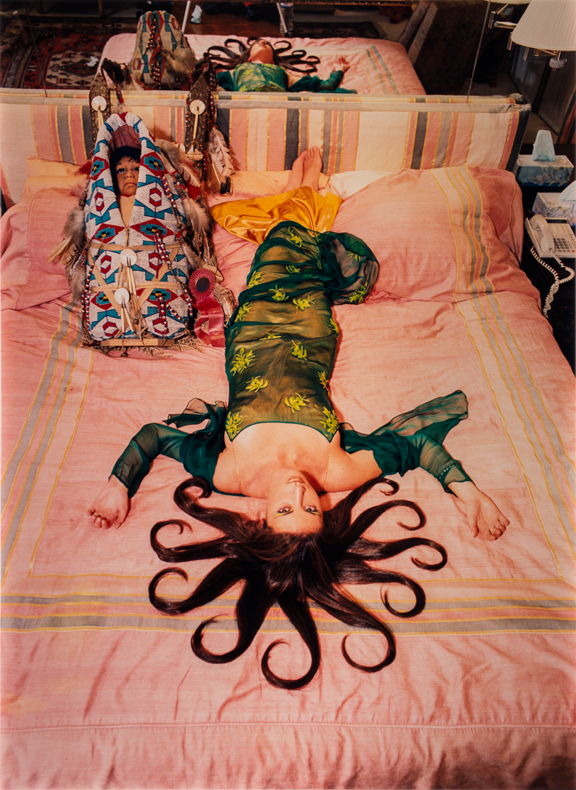 “A Girl and Her Room,” her largest series, features images of young women surrounded by their possessions and creations. 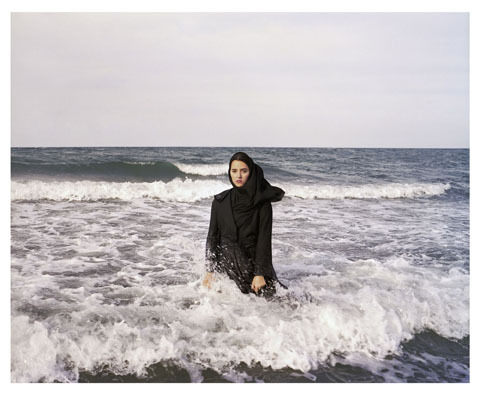 NMWA’s summer exhibition She Who Tells a Story: Women Photographers from Iran and the Arab World is organized around three themes: Constructing Identities, Deconstructing Orientalism, and New Documentary. Artists in She Who Tells a Story explore questions of identity from the perspectives of religion, politics, gender, and history. Highlighting difference, connection, individuality, and universality, these works offer alternate views of Arab and Iranian female identity. Many works on view examine identity in the context of political restrictions on women. 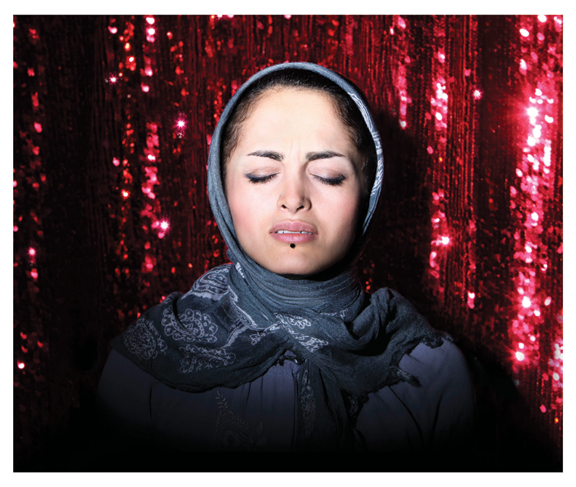 In her efforts to explore the social and political circumstances of Iranian women, Newsha Tavakolian photographed and filmed professional female musicians forbidden to record or publicly perform in her series “Listen” (2010). With a multi-faceted meaning, this work mourns “limitations on her freedom” while maintaining a tone of defiance. “Listen” reminds viewers that Iranian women are more than the ideals endorsed by the powerful, with identities and desires of their own. Simultaneously, the work dissuades men and Westerners from projecting their own biases and identities onto the image. “Listen” insists that Iranian women are not symbols or mirrors to reflect Western beliefs about the Islamic world, but individuals who can tell their own stories. Tanya Habjouqa’s “Women of Gaza” series offers an alternative view of Arab female identity that focuses on female empowerment. 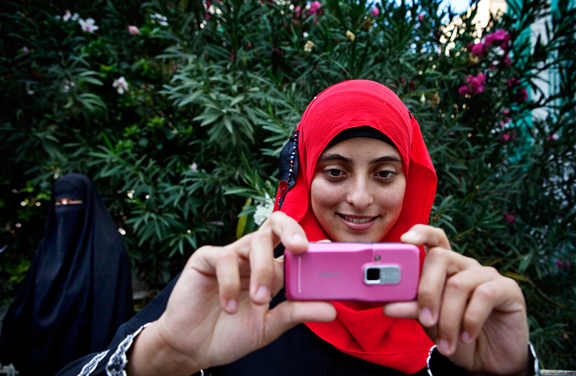 One photograph from the series shows a young woman snapping a picture with her cell phone camera. Depicting the girl in the process of looking and creating subverts viewers’ expectations and challenges stereotypes. The girl is an active subject whose gaze is indirectly fixed on viewers through the screen of her phone, appearing to watch them watching her. Habjouqa shows this young woman as a creator in her own right, upending the stereotypical objectified role of Arab women. Artists like Tavakolian and Habjouqa are not simply investigating their own identities. They also share new possibilities for Arab and Iranian female identity and argue that women must be participants in—rather than objects of—representations that seek to tell meaningful stories. By portraying their subjects as active creators and storytellers, these artists reject stereotypes and offer images of women empowered to forge their own paths. 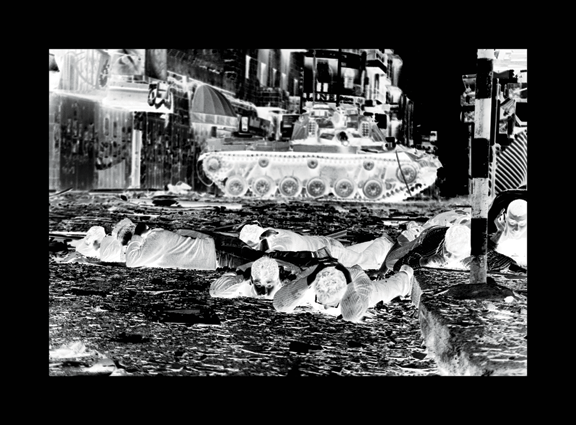 Hammam’s work addresses the 18-day uprising in Egypt in January 2011 and its aftermath. Ten photographs from the first part of the “Cairo Year One” series, “Upekkha” (2011), and two from later works in the series, “Unfolding” (2012), are on view in the exhibition. 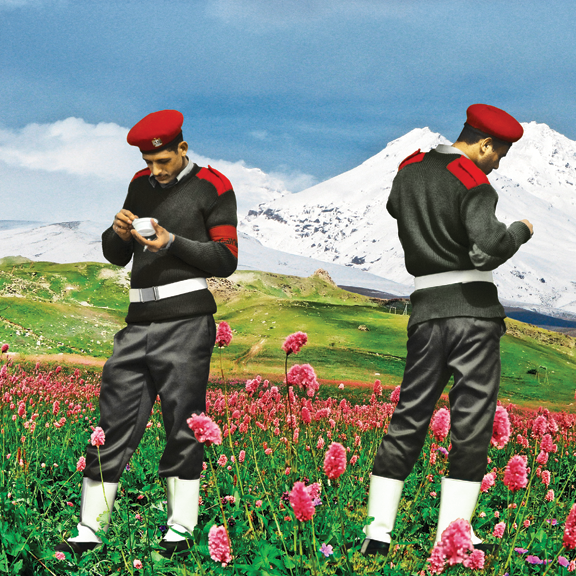 Hammam juxtaposes images of soldiers in Tahrir Square during the uprising with peaceful scenes from her personal collection of postcards.